Three Sierra Leone natives whose November 7, 1898 hanging we recall here might have had their fate written in the stars before time itself began, but a much more proximate document was the understanding concluded among European powers at the Berlin Conference of 1884-85. 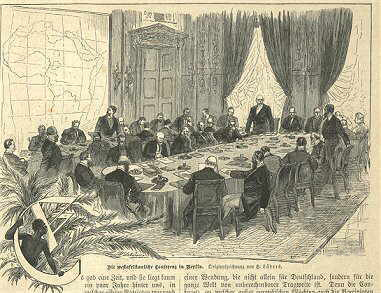 This summit aimed to regularize the so-called “scramble for Africa” among rival European empires by setting forth some rules about who got to plant what flags where. One of those rules was known as the Principle of Effective Occupation: as the name suggests, the Principle was that a colonial power actually had to be in something like control of the territory it proposed to call its own. The Berlin Conference kicked off a generation of frenetic jockeying and conquest that carved up the continent. 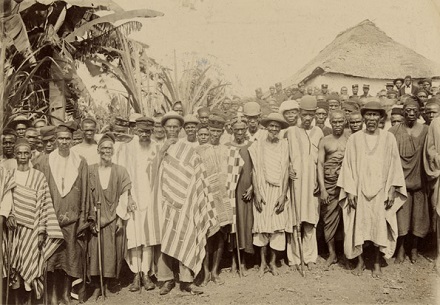 Further to Effective Occupation, the British expanded their longstanding coastal presence at Freetown by, in 1896, annexing the inland regions into something now christened the Protectorate of Sierra Leone. All that Protectorating didn’t come cheap. Who better to pay for it than the Protectorated? Britain’s proconsul accordingly dropped a Hut Tax on his subjects — a ruinously steep one that stoked an 1898 rebellion known as the Hut Tax War. The brief but bloody war (actually an amalgamation of two distinct rebellions, north and south) cost hundreds of lives on each side, not sparing civilians. British colonial agent Thomas Joshua Alldridge, who authored several studies of the colony and its inhabitants, was part of the July expedition raiding a town called Bambaia on Sherbro Island. I had already sent to the chief of this town, giving him an ultimatum — that if he would not by a certain day, come up and tender his unconditional submission, a punitive expedition would be the result. He was a notoriously bad character and did some terrible things, for which he was afterwards tried and hanged. The disregarding of the ultimatum caused the present expedition. I was informed that when we arrived at the waterside he had cleared out with the people before we could get into the town. Presently a few people returned, and it was evident that he was in hiding near; but to attempt to hunt for men in the African bush is a waste of time, the bush being their natural stronghold. I sent messages by the people, and had it loudly called out that if he would return to the town by 4 o’clock that I would not destroy the place, but that if he did not appear before me by that time it would be burnt. As he did not do so and I could get no information whatever, the straggling and outlying parts of the town were fired, and in the morning the town itself was destroyed. 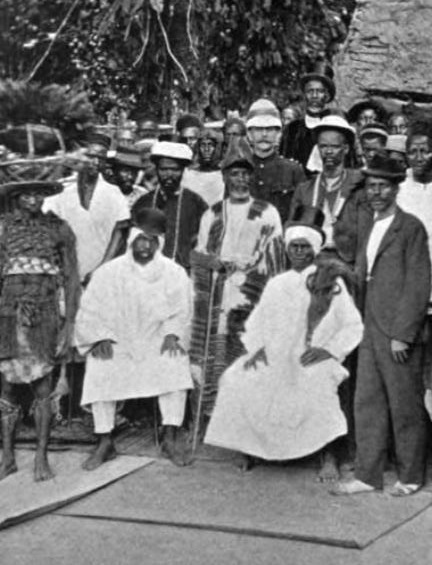 In this 1896 photo, Alldridge recorded the election by the chiefs of Imperri — a region of Sherbro Island — of a paramount chief (Sokong). He’s the rightmost of the two seated men, wearing a black top hat; beside him sits a counselor described by Alldridge as the Imperri Prime Minister (Lavari). The quality of this image isn’t the best; it’s just taken from a Google images scan of Alldridge’s public domain book A Transformed Colony: Sierra Leone, as it Was, and as it Is. Alldridge notes that both the Sokong and the Lavari later “suffered the full penalty of the law” for the rebellion. Identified beneath the print are the Sokong, the Prime Minister and ‘a principal Kruba’ (military leader) with the following remark: ‘all of whom were tried for murder and hanged at Bonthe, Sherbro, 7th November 1898′. Unfortunately, I’ve never been able to find a version of this photo that actually reproduces in situ the identifications alluded to. Perhaps there is a reader who can identify the Sokong and Lavari from the first picture in the second?